We were honored to work with the USGS and others on this critical project. We believe that data and analysis provided by the QSI team will provide insights into future scenarios, enabling emergency responders to protect the surrounding community. Quantum Spatial, Inc.(QSI), the nation’s largest independent geospatial data firm, today announced it has conducted high-resolution LiDAR surveys of areas surrounding the Kilauea volcano eruption on the Island of Hawaii. 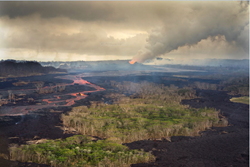 This emergency response effort was part of the United States Geological Survey's (USGS) Rapid Response Imagery Products (RRIP) in support of the Kilauea's 2018 East Rift Zone - Remote Sensing Acquisition Requirement. The USGS Hawaiian Volcano Observatory (HVO), along with emergency responders, government agencies and academics, will use the data to better understand the conditions and characteristics of the Kilauea volcano, which has been continually erupting since May 3, 2018. Data also will assist planners in modeling potential lava flows, which may better predict and respond to future flows and enhance safety of residents. Five distinct locations, covering an area of 57 square miles, were targeted: Kīlauea Summit Caldera, Pu'u O'o Crater and flow, Chain of Craters Road / Kaoe, Puna Geothermal Venture (PGV) and Western Leilani Estates lava field. "Airborne LiDAR and imagery remote sensing surveys are invaluable tools for understanding the effects of active volcanic eruptions, which change the topography as fissures emerge and lava flows extend to the ocean," said Michael Shillenn, vice president at QSI. "We were honored to work with the USGS and others on this critical project. We believe that data and analysis provided by the QSI team will provide insights into future scenarios, enabling emergency responders to protect the surrounding community." Quantum Spatial, Inc.,(QSI) the nation’s largest independent geospatial data firm, provides geographic insights to the largest government and corporate organizations that need geospatial intelligence to mitigate risk, plan for growth, better manage resources and advance scientific understanding. A pioneer in advanced mapping technology, QSI’s end-to-end solutions and services deliver the industry’s highest data quality and accuracy, while leveraging the widest array of technologies for analyzing all types of terrains. Customers use the company’s acquisition, processing, analytics and visualization solutions in a range of technical and scientific disciplines – from geology and biology, to hydrology, forestry and civil engineering. Utilities, oil and gas producers, engineering and construction firms, as well as the military and major government agencies, are QSI customers. QSI has multiple offices around the country. For more information visit quantumspatial.com, join us on LinkedIn or follow us on Twitter @QuantumSpatia l.